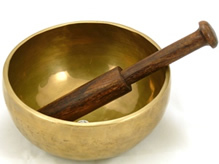 Many people enjoy singing bowls by simply tapping the bowl with a wooden stick and letting the bowl ring. 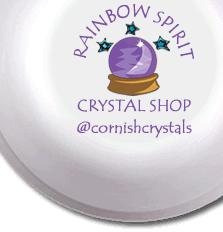 For a sustained note, more suitable for meditation, chakra balancing or cleansing work, the stick is rubbed around the rim of the bowl. To achieve this, hold the stick in your active hand (ie: depending on whether you are right or left handed) and place the bowl on your other palm, keeping the fingers straight to avoid touching the bowl’s sides and dulling the sound. You can start the bowl’s sound by a small tap and then rub the rim of the bowl by rolling the stick in an anti-clockwise motion. The stick should be dragged slowly around the rim, with a reasonable amount of pressure. The vibration created will be felt in your hand, and as this builds, the bowl will start to sing. Once the bowl is singing, you can either stop using the stick, and hold the bowl up to your ear to listen, or continue with the stick. Try varying the pressure and you will find different effects in a range from a light touch, where the stick skims, to a heavy pressure that can produce a deep note, but with the tendency to drag and make a strong metallic cry. 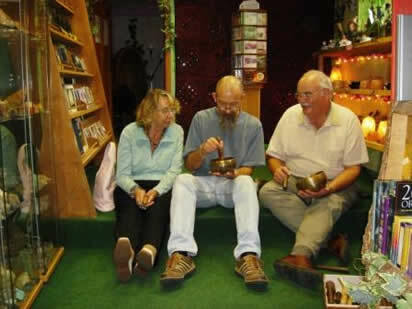 As our singing bowls are handmade, each will respond differently to speed and pressure. For all of them, keep the pressure constant to ‘sing’ the bowl. Try varying the angle of the stick to explore the multi-tonal nature of the individual bowl. To add another dimension, just add water! Bottled or spring water is best. It will change the note and tone of the bowl while you are playing. Watch the pattern that the ripples make, as some bowls will produce beautiful mandalas. Here is a table we've drawn up to explain the crystal singing bowl notes in relation to the Charka. Adrenal glands, spinal column, kidneys.